THE quest for an experience has taken over giant portions of our lives. Everywhere, we are assaulted by endless opportunities and activities. We text and get texts wherever we are, even behind the wheel. We constantly post what we're doing and where we are, letting friends know how active we are. We take part in ever more extreme sports. We work not on our own, but in teams and in social spaces, bullpens for offices, coffee shops for self-employed free agents. And when we go on vacation, we spend our time shopping, eating and seeking adventure. Even in Europe's old cities of culture, some people might stop in at the Louvre or the Uffizi, but often just to snap a few pictures on their cellphones to prove they were there. Trying to keep pace, cultural institutions are changing, too, offering more of the kinds of participatory experiences available almost everywhere else. Playwrights now turn theatergoers into participants or let them choose the ending. 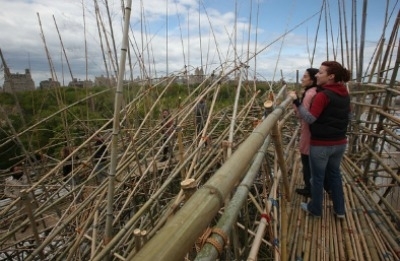 Botanical gardens are adding skywalks that let visitors traipse through treetops. Museums stage sleepovers in the galleries and dance parties in huge atriums that were built to be gathering spaces. The landmark Beaux-Arts headquarters of the New York Public Library, on Fifth Avenue in Midtown Manhattan, a sedate research institution, may soon be transformed with the addition of a gigantic branch library, where the main draws will be meeting places and areas for teenagers and children. A ground-floor cafe has already moved in. Who needs Starbucks? One day last fall, while visiting the Cleveland Museum of Art, I entered a small glass-walled corner gallery to view the British artist Martin Creed's "Work No. 965: Half the Air in a Given Space." Suddenly immersed in a sea of purple balloons that filled the air far above my head, I could see nothing but grape-colored latex and the occasional glimpse of an arm or head belonging to another visitor. I pushed through, the balloons bobbling above me, and eventually made my way back to the exit, with static in my hair and clothes clinging to my body. Mr. Creed's playful work — his attempt to make the invisible (air) visible — has been described as an "epic sculpture/installation/happening," but really, it's an experience. You couldn't "see" it without participating in it. "Work No. 965" occupied only a small corner of the museum, one previously occupied by Rodin sculptures, but it represented a clash of values that's pulling art museums away from their past. The Cleveland Museum's chief curator, C. Griffith Mann (who was recently hired by the Metropolitan Museum of Art as curator in charge of the medieval art department and the Cloisters), signaled as much, perhaps unwittingly, when he announced that Mr. Creed's artwork would "activate" the museum's east wing. In ages past, art museums didn't need activating. They were treasure houses, filled with masterpieces meant to outlast the moment of their making, to speak to the universal. Visiting one might be social — you went with friends — but fairly passive. People went to see beauty, find inspiration, experience uplift, sometimes in a spiritual sort of way. Museums housed their heritage, their raison d'être. But the spirit of "Work No. 965" is everywhere, common among curators, museum directors and, of course, artists. You could see it in "Rain Room," the popular summer installation at MoMA that was billed as giving "visitors the experience of controlling the rain." You could see it when the Metropolitan Museum's summer rooftop installations like "Big Bambú" by the Starn Twins (2010) and Tomás Saraceno's mirrored, modular habitat "Cloud City" (2012) — both walk-through experiences — become the talk of the town, while Anthony Caro's steel sculptures (2011) and this year's landscapes by Imran Qureshi did not. At the New Museum of Contemporary Art, Carsten Höller's appropriately named "Experience," which gave visitors the opportunity to slide down a corkscrew path from the fourth floor to the second and was described, according to The New York Times, "as an art world amusement park," drew lines around the block in 2011. 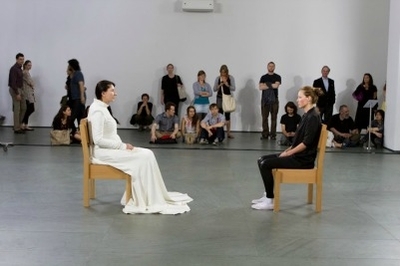 Need I mention Marina Abramovic's "The Artist Is Present" at the Museum of Modern Art in 2010, a participatory performance piece that had New Yorkers queuing up for hours to sit in silence opposite the artist, who simply stared in return? What was that about but the experience? IN the world of commerce, this trend has been going on for decades. By 1998, two consultants, B. Joseph Pine II and James H. Gilmore, had coined the term "the experience economy" and were urging businesses to offer customers a memorable time, rather than a product or service. On that theory rest businesses like Chuck E. Cheese's, Build-A-Bear Workshops, Niketown, hotels as tourist destinations and virtually all of Las Vegas (which, by the way, no longer has an art museum — the Las Vegas Art Museum closed in February 2009 after nearly 60 years of operation, a victim of poor attendance and declining donations). In this kind of world, the thrill of standing before art — except perhaps for works by boldface-name artists like van Gogh, Vermeer, Monet and Picasso (and leaving aside contemporary artists who draw attention by being outrageously controversial) — seems not quite exciting enough for most people. What's a museum to do? Glenn D. Lowry, the director of the Museum of Modern Art, has seen the future. In a speech he gave a while back in Australia, he noted that museums had to make a "shift away from passive experiences to interactive or participatory experiences, from art that is hanging on the wall to art that invites people to become part of it." And, he said, art museums had to shed the idea of being a repository and become social spaces. He qualified those thoughts a bit, saying he was speaking mainly of museums that dealt primarily with contemporary art. But I'm not sure of the thesis or the qualification — or the application. I've seen museums offer people the opportunity to participate in curating exhibitions, choosing which artworks from their collections should be sold to raise money, deciding whether an altered painting should be restored to its original condition, advising on the design of gallery installations and more. Shouldn't those decisions be left to the experts? If not, what do they do? Why study art history? In another manifestation of the trend, museums are embedding interactive displays in their painting galleries. They are gamifying them. Some are retooling their lecture programs — which attract older audiences. As Alexander Bortolot, an art historian and the "curatorial content strategist" at the Minneapolis Institute of Arts, told me last year, younger people want museums to connect them to the creative economy. They don't want to listen to some art historian flown in from New York; they'd rather network with members of the local arts community and take part in a conversation. This is all in the name of participation and experience — also called visitor engagement — but it changes the very nature of museums, and the expectations of visitors. It changes who will go to museums and for what. For decades, museums have offered social experiences — the fact that you can talk while you're in the galleries has always given them an edge over the performing arts — and that is good. Now is the balance shifting too far to the experience? Are they losing what makes them unique? Should museums really follow the path of those "experience" businesses? If they do, something will be lost. After the terrorist attack at the Boston Marathon in April, Thomas P. Campbell, the Metropolitan Museum's director, reached out to the Museum of Fine Arts in Boston with the offer to lend three paintings, all dealing obliquely with contemplation, for a special free exhibition there. At the time, he said, "Great museums are places of solace and inspiration, particularly when tragedy strikes a community." When so many people go instead for an experience, that aspect of art museums — a key part of their identity — is at risk.